« Got a cosmology question? In the x-direction (horizontally), the ball moves with whatever horizontal velocity the thrower gave it to start with. In the y-direction (vertically), the ball is pulled downwards, its vertical velocity changing at the constant rate of 9.8 m/s/s. where $latex v$ is the speed of the ball, is the density of air , is the cross sectional area of the ball and is a dimensionless factor called the drag coefficient. In practice, we use this formula in a different way. The terminal velocity is measurable, so we can use it to constrain the drag coefficient . E.g. for a cricket ball, the terminal velocity is 123 km/h. We now have all the pieces we need. The equation of motion is not solvable analytically, but is easily handled by any good numerical ODE solver. I’ll be using those of Matlab. Let’s start with a few trajectories. 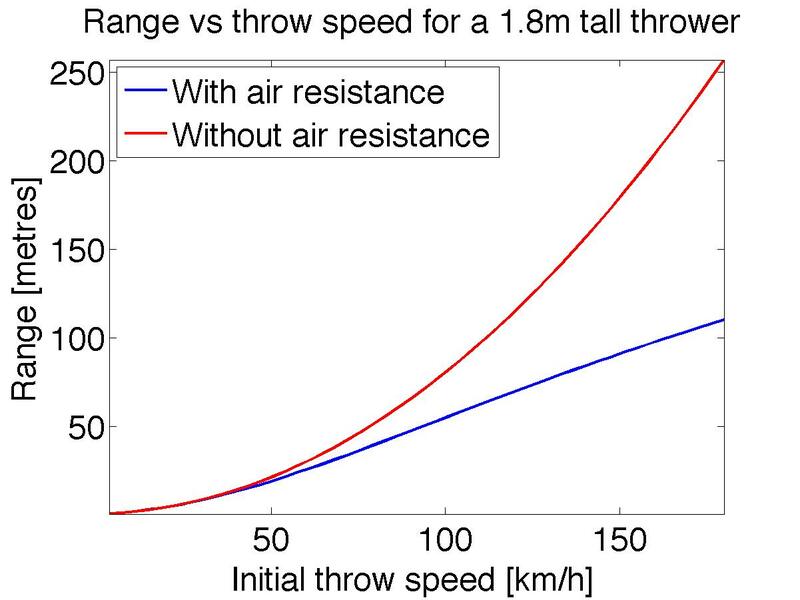 I’m assuming that the thrower releases the ball from 1.8m. The black, red and green lines are for balls thrown at 120, 140 and 160 km/h respectively. The initial angle of the trajectory is chosen to maximize the distance thrown. As expected, when wind resistance is taken into account, the balls trajectory drops more sharply after the ball reaches it’s peak. The difference in the range is quite significant – more than a factor of two for the ball thrown at 160 km/h. The longest ever throw of a cricket ball seems to be about 140 yards, or about 128 metres. Given that the fastest baseball pitch is 169km/h, the model predicts a range of 103 metres. I’m not sure what the reason for the discrepancy is. An extra 10 km/h gets another 7 metres, though I think it’s unlikely that anyone can throw faster than baseball pitchers, even with the aid of a run-up. I’ve ignored the effect of spin – a ball thrown at 160km/h would have considerable backspin. This would increase the range, as slice does for a tennis ball. I’m not sure how to calculate the magnitude of the effect. Wind assistance and the favourable effects of high altitude are also possible contributors. The range increases as the velocity squared in the absence of wind resistance. With wind resistance, we see this behaviour at low velocity but a slower, linear increase at velocities above about 50 km/h. Thus, a 220 metre throw only goes about 100 metres. Incidentally, if you threw a ball that fast on the moon, with no wind resistance and lower gravity, the ball would travel about 1.4 km. I think the reason for the discrepancy between the range and the pitch speed is that the pitch speed measurement is not a “muzzle velocity” but rather a mean speed from pitcher to plate. That’s a *lot* slower than the muzzle velocity. In cricket, bowling speeds are measured with a radar gun, presumably pointed at the release point, rather than calculated as an average over the flight. This creates a line-of-sight problem – the direction that the radar gun is pointed won’t be perfectly aligned with the initial velocity of the ball, so the measured speed will be less than the true speed. As my model stands, a 128m throw would require an initial speed of 210km/h = 130 mph. So I still think the model is missing something at high velocities.